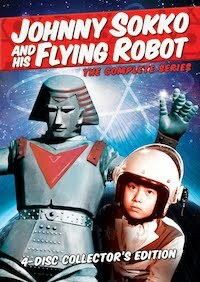 Original 1972 TV Series Coming to US Blu-ray! Original '70s artwork for SCIENCE NINJA TEAM: GATCHAMAN. UPDATED! 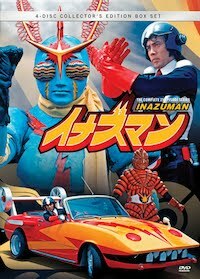 2013 is turning into a bumper crop year for fans of classic tokusatsu and anime in the US, with numerous DVD releases, and more on the way including Shout! 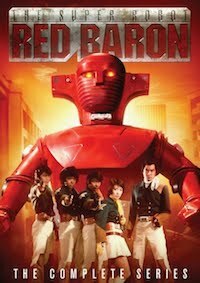 Factory's ULTRA Q, GAIKING, and STARZINGER, as well as Discotek Media's CAPTAIN HARLOCK, CUTIE HONEY, and MAZINGER Z to name but a few. Now, 105-episodes of Tatsunoko Productions’ original SCIENCE NINJA TEAM: GATCHAMAN series is coming to the US from Sentai Filmworks (formed out of the ashes of ADV Films) in both DVD and BD editions for the first time on October 29th! 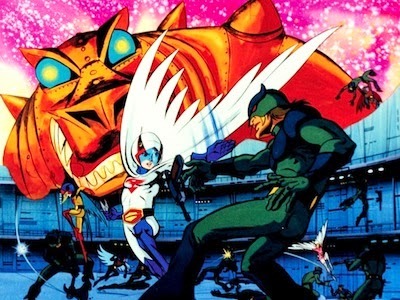 Evocative Tatsunoko Productions publicity art for the original series. 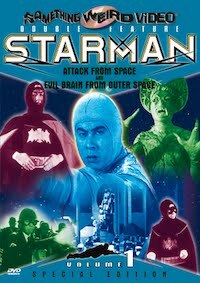 Using super-scientific weapons, the global terrorist network known as Galactor is out to steal all of Earth’s resources. Mankind’s only hope? The International Science Organization and their elite strike force, the Science Ninja Team! But the five young heroes have their work cut out for them as they take on Galactor’s sinister arsenal of giant robots, mechanized weapons and endless armies of henchmen. Now, utilizing the incredible tech created by Dr. Nambu, and with their mighty airship the God Phoenix, GATCHAMAN just might! The Science Ninja Team's resident badass, G-2: Joe the Condor! 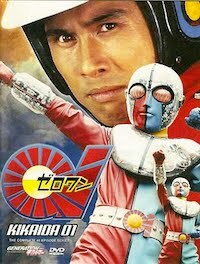 The classic 1972-74 series is a benchmark in the genre, which took the conventions higher than ever before in terms of multiple story arcs, layered character development, and added a decidedly mature spin to what was previously labeled “Terebi Manga” (TV Cartoons). 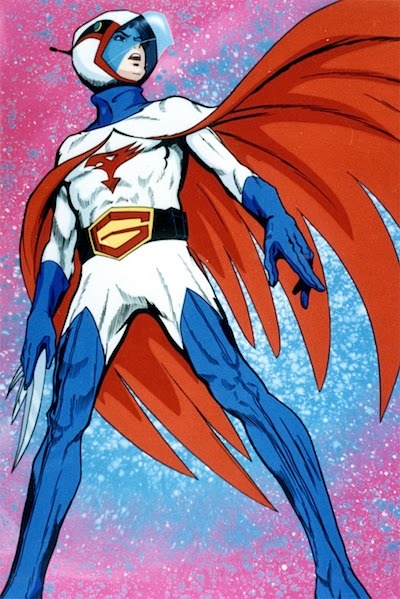 GATCHAMAN took the visual trappings of American superheroes, and brought them into the 21st Century with progressive designs, from their cutting-edge technology to the complex mechanical monsters of Galactor they encounter. 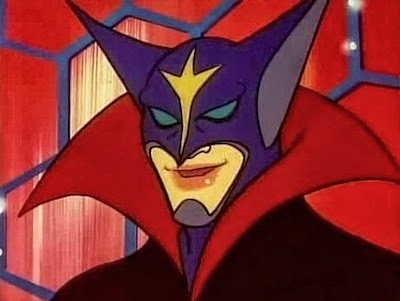 The twisted Berg Katze, shapeshifting commandant of Galactor! 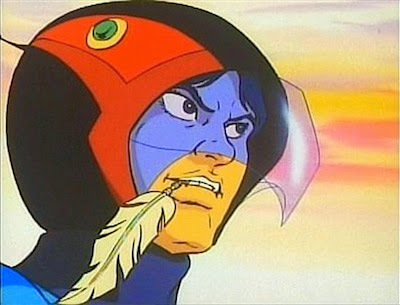 Heavily-edited and truncated for US television as BATTLE OF THE PLANETS in 1978, and revised for Turner Broadcasting Services as G-FORCE in 1986, GATCHAMAN was originally issued uncut on DVD in 2004 by the now-defunct ADV Films. 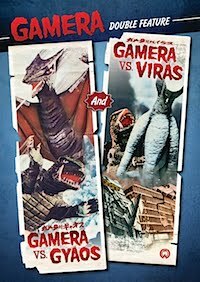 Sentai Filmworks is boasting both DVD and Blu-ray, Japanese and English audio tracks, and English Subtitles in one big boxset for $129.98 (DVD) and $149.98 (Blu-ray), including the three-part 1994 OVA series. 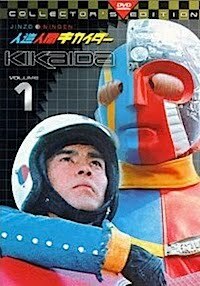 Hopefully, these will be the HD remastered editions released in Japan last year by Tatsunoko and Shochiku Home Video — because I can't wait! 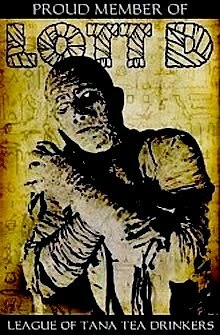 The Legendary Masked Wrestler Rises... Again! The Tiger Mask Rises... Will this new incarnation survive the legend? 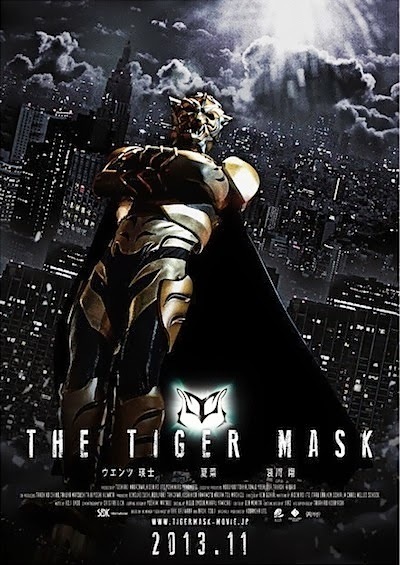 Yesterday, the Japanese entertainment website, Eiga.com, obtained exclusive coverage for the upcoming live action adaptation of Ikki Kajiwara and Naoki Tsuji’s popular manga and anime series, TIGER MASK, starring Eiji Wentz (Ge-Ge-Ge-no Kitaro). 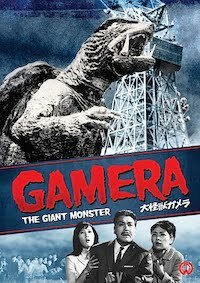 Ark Entertainment also announced that the film would see nationwide release in Japan in November, but will have it's world premiere at this July’s Fantasia International Film Festival in Montreal. 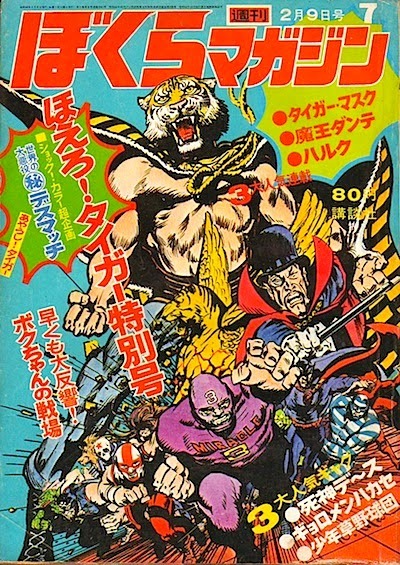 Striking February 1971 Tiger Mask cover of Bokura Magazine. 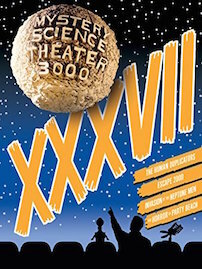 DVD jacket for the original animated series that ran for 105 episodes. 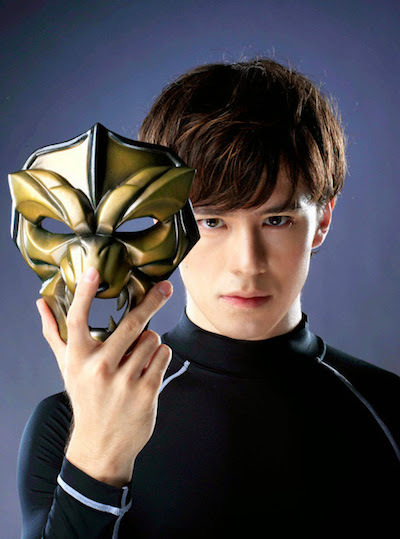 Eiji Wentz as Naoto Date, the new man behind the Tiger Mask. 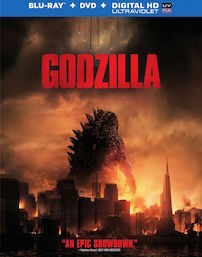 Production wrapped at the end of December 2011, helmed by director Ken Ochiai (Blood Ties), the first Japanese native to win the Special Jury Prize from Directors Guild of America in 2010 for HALF KENNETH (2009). “We were able to achieve quite a bit, from cinematography to visual effects, and it was a quite a good experience,” he recalled. Natsuna as heroine Ruriko Wakatsuki, Naoto Date's love interest. As Naoto Date, standing in the center of this arena of high stakes and black money, Wentz is joined by Natsuna (Gantz) as Ruriko Wakatsuki and Sho Aikawa (Zebraman) as Mr. X, who are among the star-studded cast, as he dons the special hood to become Tiger Mask. Even the life of his friends, the heart and soul of Naoto, will be robbed by ruthless enemies, pushing him forward in his determination to maintain his belief in justice, while embracing intense hatred. Here's the first teaser trailer for the upcoming live action version. 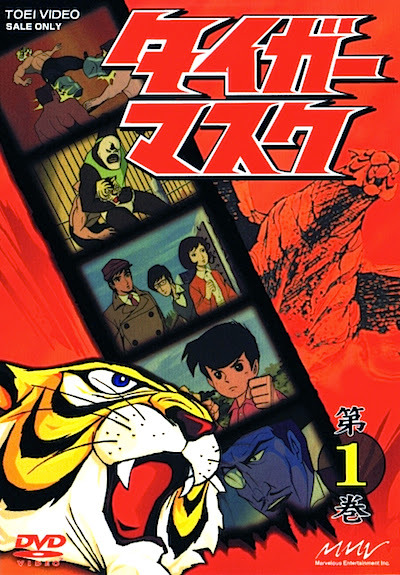 Visit the official TIGER MASK website. 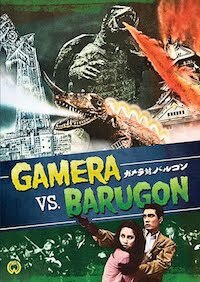 Source: Eiga.com, translation by August Ragone. 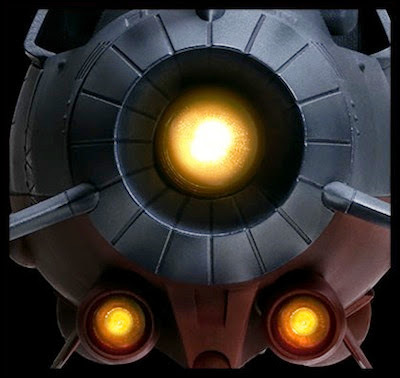 ALL-NEW "SOUL OF CHOGOKIN: YAMATO 2199"
Bandai's 3rd Diecast Version Is the Charm! New SOC Yamato 2199 brochure from the 2013 Tokyo Toy Show. 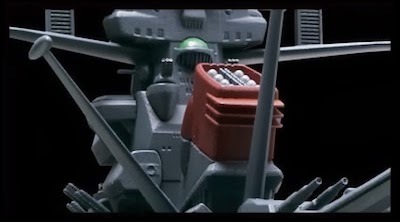 “Chogokin” is a magic word for a generation of children in the 1970s and 1980s, meaning “Ultra Alloy” — derived from the name of the metal used to build the titular super robot in MAZINGER Z (1972-74) — was a line of diecast toys jammed with numerous gimmicks hidden within their metal chassis (each having their own unique approach), igniting the passions of boys across Japan. Launched in 1972 by Popy, the character toy division of Bandai, the line has come to represent a timeless aesthetic, which was revived in 1997, with the launch of the “Soul of Chogokin” line, aimed at Big Boys (yes, we grown-up types). 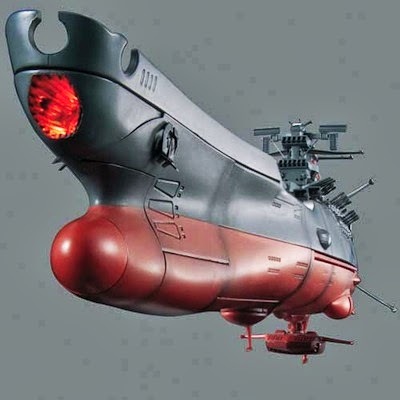 The Soul of Popynica BPX-01: Space Battleship Yamato from 2001. 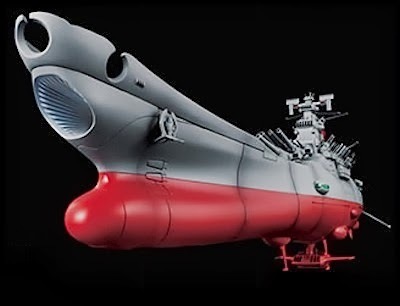 Continuing to this day, the SOC line has already introduced two versions of the Space Battleship Yamato — the first being part of the short-lived “Soul of Popynica” line (for vehicles and spacecraft) and code numbered BPX-01, released in 2001, which was an amalgam of Yamato designs based on a consensus of various representations of the ship. 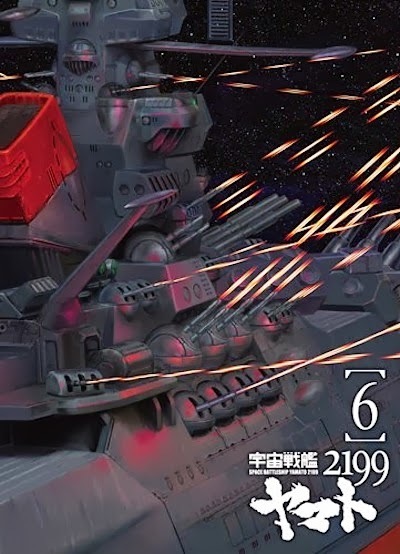 Since Yamato refuses to die, Bandai decided to release an additional version, in anticipation of the live action film, and so on November 27, 2010, the SOC GX-57 was issued, based on the classic animated version. 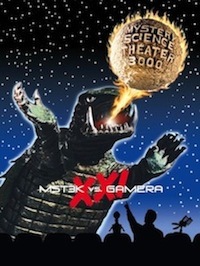 Both featured a number of gimmicks, including light, sound effect, and music features. The Soul of Chogokin GX-57: Space Battleship Yamato from 2010. 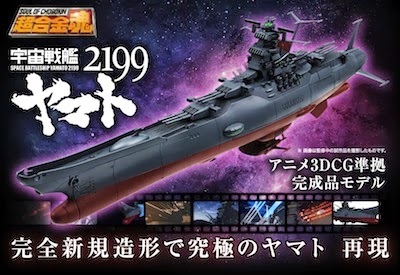 Now, with the success of SPACE BATTLESHIP YAMATO: 2199, Bandai is giving the iconic ship another SOC treatment. This time, in order to achieve a more realistic proportion, since the original designs were contradictory, this version employs the same 3D modeling data used for the new animated series (employed on last year’s 1/1000 plastic model kit). Thus, boasting a completely new shape than the previous versions, overcoming problems inherent in realizing the old school 2D design into a 3D product. In this sense, the new SOC is perfect — especially when compared to previous versions. 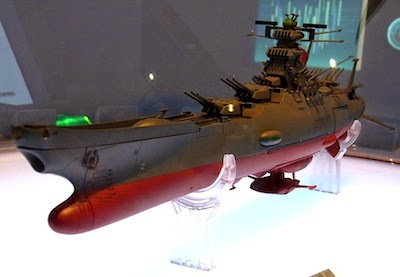 The all-new Soul of Chogokin: Space Battleship Yamato 2199. 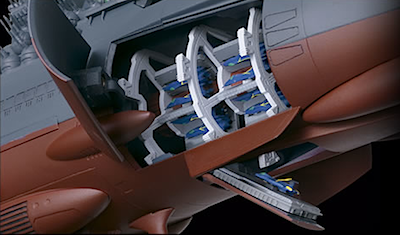 One of the new features of the 2199 version of Yamato is the radical difference of concept in terms of the fighter hanger and hatch. In the new series, in order to accommodate a large compliment of fighters in a limited space, they are stored and deployed from a mechanical ring and palette system. This is faithfully reproduced in the new SOC with attention to minute detail. The ring itself is made of metal, and features the same action as in the anime. Additionally, the exit and re-entry hatch opens, and has a working launch catapult for the Cosmo Falcons. Detail of the Hanger, Ring System, and Hatch/catapult System. 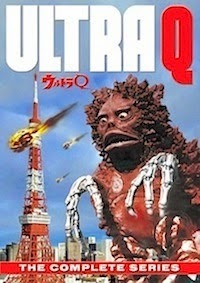 As with the previous SOC editions, this version also features a range of gimmicks operated by remote control. 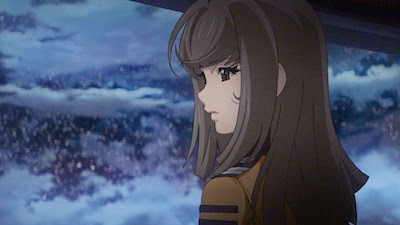 In terms of playable audio, a wide range of sound effect recordings are used in the new series, and some of the key effects were chosen for solo as well as multiple playback, completing the image of Yamato. In particular, there are two firings of the main guns that can be selected: The positron cannons (Shock Cannons) and the artillery rounds (Type-3 Fusion Shells). When you turn on the main power, the Wave Motion Engine fires up, while the engine nozzle and bridges begin to light up. Wave Motion and Sub Engine nozzles with animated LED gimmick. Improved Wave Motion Gun animated LED firing gimmick. Bow detail with CIC, Bridge, and Captain's Cabin LED lights. Detail of Smokestack Missile Firing Silo. Materials: ABS plastic, diecast, etc. SOC Yamato 2199 on display at the 2013 Tokyo Toy Show. 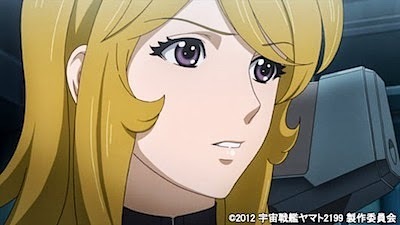 "YAMATO: 2199 CHAPTER 6" BOWS JUNE 15th! 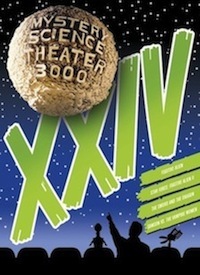 Promo heralding the final two chapters and the television broadcast. 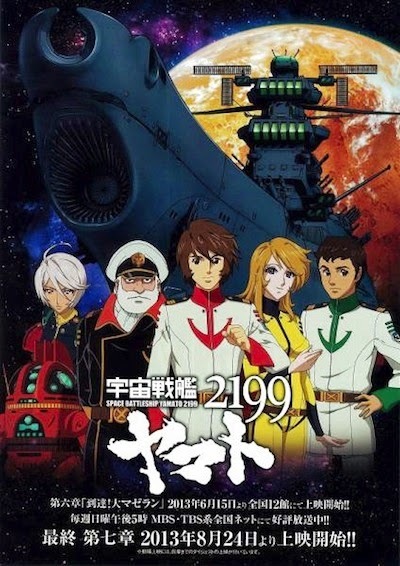 Opening in sixteen Japanese cinemas this weekend (up four from the previous theatrical release), is the highly-anticpated 6th Chapter of the SPACE BATTLESHIP YAMATO: 2199 feature films, REACHED! THE LARGE MAGELLANIC CLOUD (Totatsu! Dai Mageran) — featuring the decisive confrontation at the Rainbow Star Cluster in order for the Yamato to complete her mission. 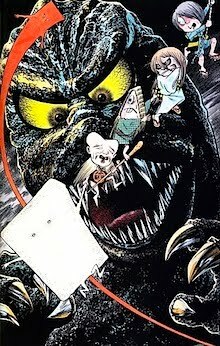 The release of the Blu-ray and DVD will follow on July 26th, while the 7th and final chapter, AND THE SHIP SAILS ON (Soshite Fune-wa Yuku), will follow on August 24th. The amazing 120-second Chapter 6 trailer with English Subtitles! 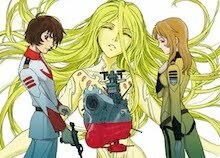 Conceived as a remake of the classic 1974 series, known in the US as STAR BLAZERS, the story follows the "Quest for Iscandar" story arc, with a number of changes and additional characters, but entirely grounded in the original look and sound, to great dramatic effect. 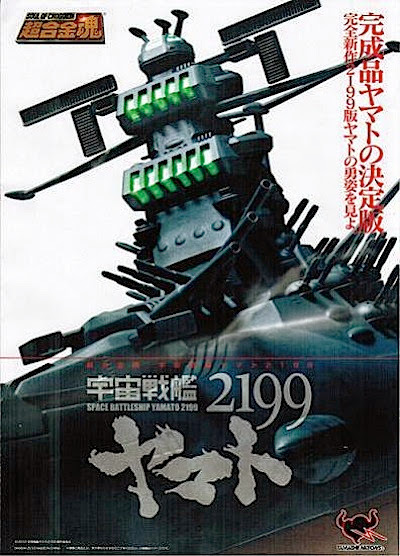 Where other remakes fail, YAMATO: 2199 soars — going above and beyond the term "remake" — exceeding all expectations and pulling the viewer, both old fan and those discovering Yamato for the first time, right into the drama, action, and top-shelf animation. 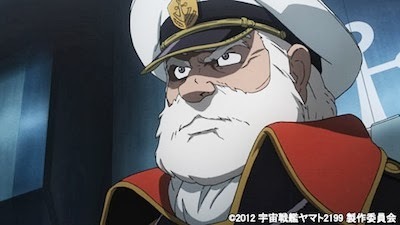 Juzo Okita, Captain of the Space Battleship Yamato. 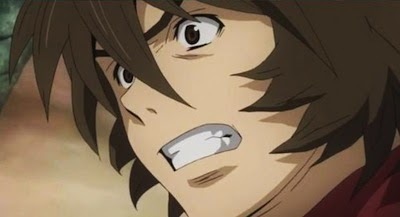 While the story may be familiar to Old Skoolers, Supervising Director Yutaka Izubuchi (RahXephon) has not only gained their respect in keeping the basic designs of the original intact, from characters to ships, but also adding to that universe, making it larger in scope and far richer in depth. All the while retaining key elements and incidents, as a first-generation fan, Izubuchi has made it surprisingly fresh without sullying our memories, and manages to strike all the proper cords — in a truly sincere and non-manipulative way. General Domel of the Great Gamilas Empire, the Wolf of Space. Izubuchi truly loves what he calls "First Yamato" and that shines through in every facet of the production, and makes YAMATO: 2199 brilliant — pulling elements from not only the wealth of movies and teleseries, but also from various abandoned story ideas, manga adaptations, novels, and other official Yamato ephemera of the first wave. This allows YAMATO: 2199 to stand on its own foundations — and if I dare say, it's the best science fiction anime in decades. 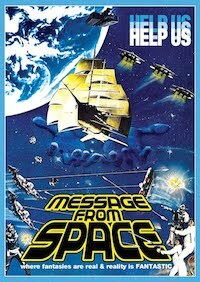 But, as another first-generation fan (before Star Blazers), I'm prejudiced. 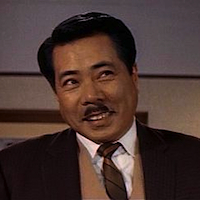 What is the mysterious past of Operations Officer Yuki Mori? 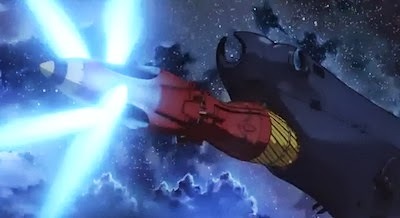 Using a business model made popular by GUNDAM UNICORN, YAMATO: 2199 was planned as a 26-episode series, which would be cut into a series of seven feature films, screened for two weeks in select theaters every two months, with respective home video releases following six weeks later (as individual episodes). The series began weekly broadcast this past April on MBS television network affiliates to cultivate a third tier of viewers. 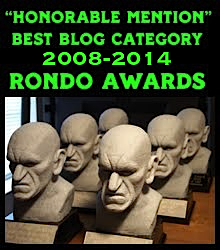 This success has helped to fuel the production, giving fans a sense of involvement. 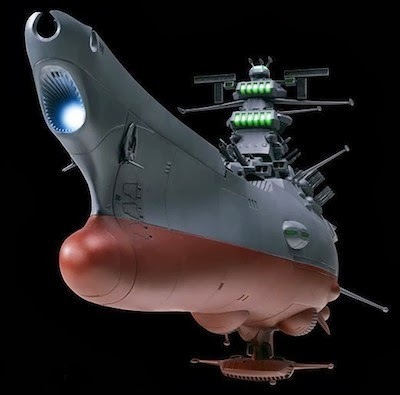 Bandai's new 2199 SOC of the famous space battleship due in winter. 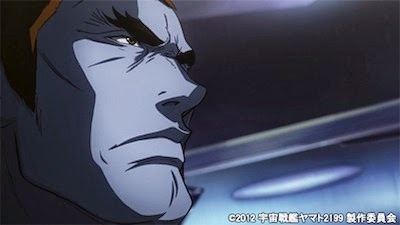 Other platforms promoting the new series has included special online previews and VOD sales. Not only has this contributed to the success, but so has the careful and calculated planning and release of a wide variety of merchandise, including items sold exclusively in theaters — including limited edition Blu-rays and DVDs. 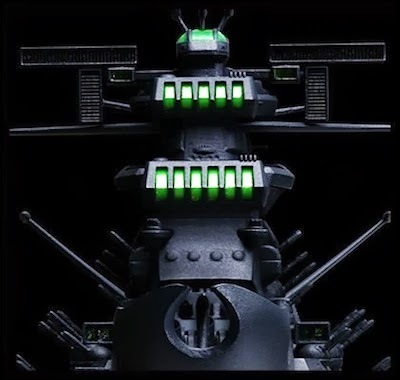 Hobby monolith, Bandai, has also followed suit with a series of high-quality model kits, with more on the way, including Bandai's third large-scale diecast and plastic Soul of Chogokin edition of the Yamato coming this winter. Vol. 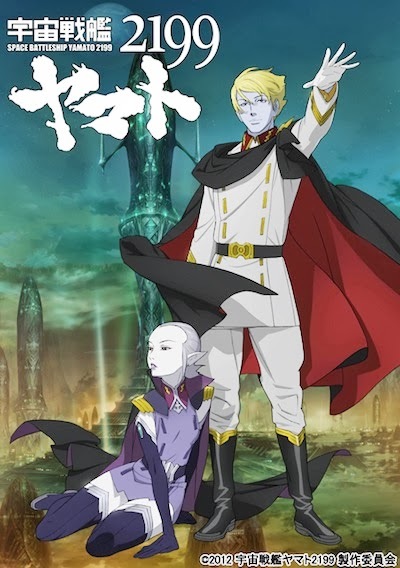 6 jacket art by Nobuteru Yuuki featuring Dessler and Celestra. The home video release of Volume 6 will contain a total of four half-hour episodes (19-22), plus a selection of special features, clocking in at 126 minutes of content for ¥8,190 for the Blu-ray (BCXA-0490, Region-free) and ¥7,140 for the DVD (BCBA-4321, Region 2). 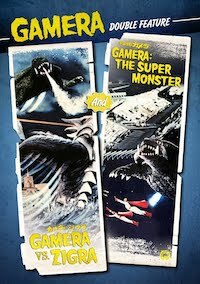 The DVD will be presented in 16:9 Anamorphic, Dual Layer, and Dolby Digital Stereo. 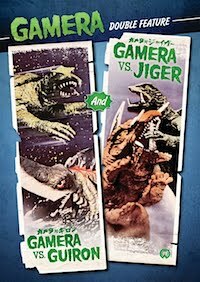 Conversely, the Blu-ray will be presented in AVCHD, BD50G, 1080p, 16:9 Anamorphic, and Linear PCM Stereo. Veteran illustrator Naoyuki Kato's exciting first pressing slip cover. 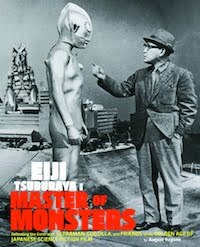 Special Features will include an Audio Commentary with voice actors Akio Otsuka (General Domel), Shinpachi Tsuji (Bem Haidern) and director Izubuchi, a Chapter 4 Digest, Commercial and Promotional Video Collection 2, Theatrical Feature Previews Part 2, and a special insert booklet. Both releases will feature the same jacket art by character designer Nobuteru Yuuki, and a slipcase by legendary Yamato illustrator, Naoyuki Kato. While the DVD contains all of the same extras, only the region-free Blu-ray boasts the most special feature of all: English Subtitles. HERE BE SPOILERS: WARING! WARING! WARING! Episode 19. THEY'VE COME (彼らは来た): Finally. the Yamato reaches the Large Magellanic Cloud, therein lies their destination: Iscandar. Meanwhile, Lord Dessler of the Great Gamilas Empire plans to block their way, and orders the infamous General Domel to intercept them. But, what secret orders has Dessler bestowed upon Domel? You can pre-order your copy of YAMATO: 2199 Volume 6, here to visit Amazon Japan (with English language support)! 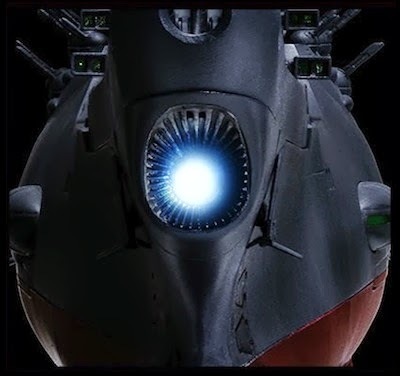 Stay tuned to this blog and the Cosmo DNA website for more news and information on SPACE BATTLESHIP YAMATO: 2199 as they develop — and soon, we'll be off to outer space, on shiny discs of blue! 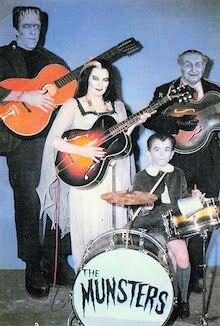 "THE SPACEKEETERS" RETURN IN "STARZINGER"! Shout! takes advantage of Toei Animation's classic promotional art. 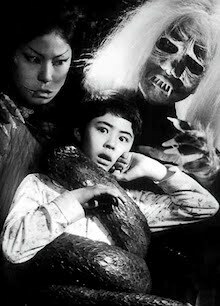 Following up on their release of the GAKING: The Movie Collection, the champion of the Japanese fantasy film enthusiast, Shout! 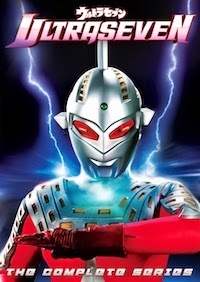 Factory is preparing to issue another 1970s anime classic, STARZINGER: The Movie Collection, a three-film compilation of the 73-episode series (it's unknown at press time if the last nine episodes, Starzinger II, are included), with English Dubbing commissioned by Toei Animation, written and directed by William Winckler (Tekkaman, The Space Knight). 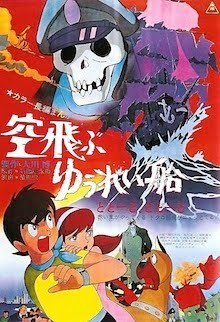 Created by anime and manga pioneer Leiji Matsumoto, who also penned the classics SPACE PIRATE: CAPTAIN HARLOCK (the subject of an upcoming and highly anticipated CGI feature from Shinji Aramaki) and GALAXY EXPRESS 999, STARZINGER was originally subtitled as "SF Saiyuki," a reference to the Japanese moniker for the 16th Century Chinese long novel, Journey to the West — better known as The Monkey King — which also inspired Akira Toriyama's DRAGON BALL franchise. In STARZINGER, Matsumoto transposes the narrative of Sun Wukong, along with his companions, protecting the pilgrimage of a buddhist monk, Tripitaka, into the vast cosmic tapestry of infinite space. 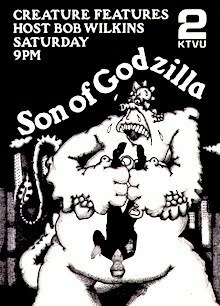 Broadcast from April 2, 1978 through August 24, 1979, the series was produced to capitalize on the Anime Boom caused by the explosive popularity of SPACE BATTLESHIP YAMATO for which Matsumoto served as a production designer and director, during the very height of his meteoric rise. The Milky Way is in chaos. Precious Galactic Energy, emanating from the Great Planet, located at the center of our galaxy, grows weak — causing structural anomalies in the very fabric of the cosmos, and mutating lifeforms in its proximity. 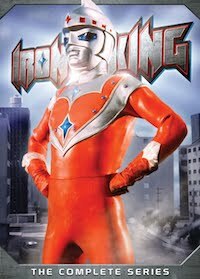 In order to restore the cosmic balance, Princess Aurora of Earth makes the perilous 30,000 light year journey with her powerful cybernetic bodyguards, Jan Kugo, Sir Djorgo, and Don Hakka. 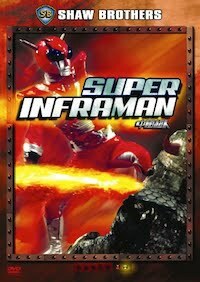 Along the way, they face many trials and encounter evil creatures who jeopardize their mission. 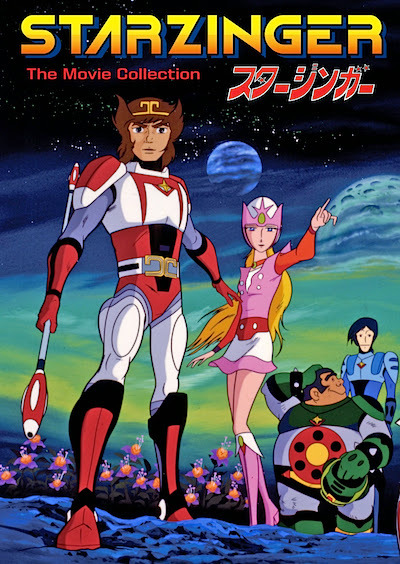 While not widely broadcast during it's original release in North America, some readers may remember the series as THE SPACEKEETERS, one of the titles under the FORCE FIVE banner, a package of five different Toei Animation series syndicated in the '80s by US anime pioneer Jim Terry, later broadcast as feature film compilations on Showtime (which were followed by subsequent VHS releases via Family Home Entertainment). 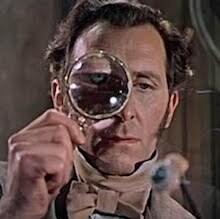 Because of the failure of similar compilations of the past (namely the aforementioned F.H.E. 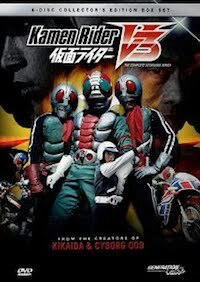 release), Toei assembled a team of in-house writers, directors, and editors to tackle the problem by allowing all of the story's major story arcs and dilemmas to be spread over three films, instead of one — resulting in a much more satisfying viewing experience. 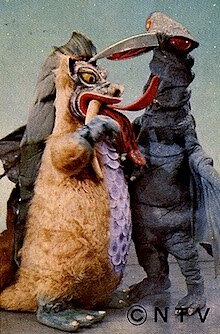 The voice cast includes Paul Oberle (Zombrex: Dead Rising Sun), Kyle Rea (The Mythical Detective Loki), and Chase Masterson (Star Trek: Deep Space Nine) as Queen Lacet. 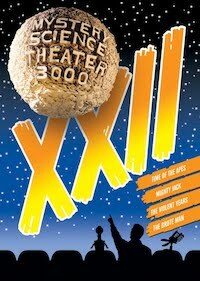 Shout's DVD-only release contains all three compilation films on two discs, running for a total of 360 minutes (approximately 5½ hours) in 2.0 Stereo. MSRP: $19.93. Street Date: August 20, 2013. Order from Amazon.com or directly from Shout! Factory!